Varpuspöllö – Eurasian Pygmy Owl – Glaucidium passerinum – Uusi kuva lisätty galleriaan! 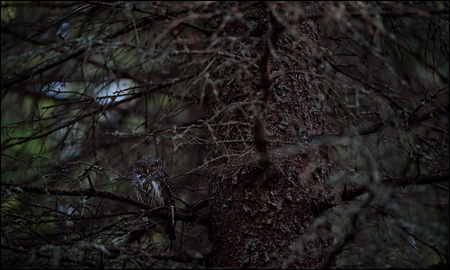 I made a little evening walk to watch if eurasian pygmy owl juriors had already left their birdnest. During walking I heard fieldfare’s warning shouts, and guessed that the adult eurasian pygmy owl might be sitting there. I carefully moved ahead and found owl spending his evening by sitting in the tree close to his birdhouse. I managed to get couple of owl pictures with my new Nikon AF-S 300/4 nikkor, which replaced my old workhorse Nikon AF-S 300/2.8 VR.